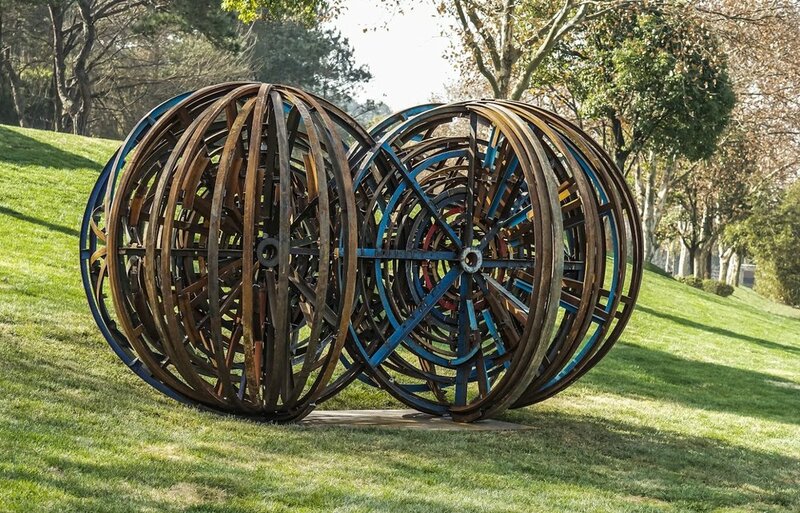 At the 1st East Lake International Ecological Sculpture Biennale was kicked off on December 17, 2017, in the Sculpture Gallery and its outdoor space, Jiufeng Urban Forestry Reserve, in collaboration with The Hubei Museum of Art, Wuhan. Made of material found at a local scrap yard while working in, Wuhan. The former purpose of the metal rings were used as wheels that once held spools of industrial electric cable that now lines and gives power to the ever growing ever, changing city of Wuhan, China. The nature of the material will change through, climate creating a patina painted by the weather. My sculpture presents two interlocking spheres of difference that are coming together creating a never-ending loop of connection to each other.